Experience the true taste of morocco with these delicious aromatic vegetarian and vegan casseroles. Fragrantly spiced and comforting, tagines are easy to prepare and sure to satisfy at every occasion. And prepared without meat (and often without dairy, too) they are not only economical, but also one of the best ways to enjoy seasonal produce. In this collection of authentic Moroccan recipes, you will find some of the best loved tagines, from Lighter Tagines, such as Roasted Cherry Tomato Tagine with Feta and Preserved Lemon or Roasted Pear, Fig and Walnut Tagine with Fennel, to Hearty Tagines including Roasted Sweet Potato Tagine with Ginger, Cinnamon and Honey or Spicy Carrot Tagine with Chickpeas, Turmeric and Coriander. 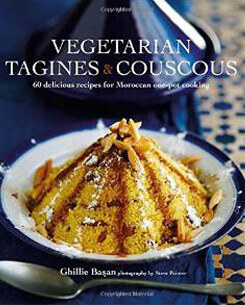 Along with the tagines, you will find recipes for it’s traditional accompaniment, couscous, prepared in a variety of exciting ways, as well as recipes for appetizers and other dishes to serve alongside. Create your own aromatic feast, worthy of any Moroccan kitchen.